﻿ Dictionary of Allegorical Words written by a Hermetic scholar. From earliest times, wise men protected themselves from church and state by using the Hermetic code. According to Joy Lonsdale, this was the Hermetic Code upon which all allegory is based. Although most dictionaries can be assessed or verified by facts, allegorical dictionaries are coloured by interpretation. Joy's preoccupation was the occult and the transformation of the psyche. Her definitions relate to two concepts: the conscious and subconscious mind. A name given to the glass or copper vessel, or still, used by the alchemists for distillation. Specifically, it applied to the head of such a vessel, therefore pointing to the mind, which must be cleansed from all superfluous thoughts. See Still, Vessel. One of the giant metalworkers trained by the smith-god, Hephaestus, to forge thunderbolts for his father, Zeus. He was one-eyed, and these clues give a wonderfully apt symbol of the initiate working on his conscious mind, armed with the great potential of its reflective power. He must be single-minded in his efforts to make contact with his inner mind, the Sun God, Zeus. The initiate, Odysseus, erred when he blinded his Cyclops, for this means he forgot for a time his one-pointed mission, and this delayed him on his journey to reach Ithaca, his real home, the subconscious. (Gr. kyklops-kyklos, a circle, and ops, an eye). See Giant, Odin. The emblem of Hermetic knowledge, later used as an emblem for Jesus, thus also for the initiate. Jesus chose fishermen to be his first disciples because those engaged in the act of fishing are meditating - the only way to obtain higher knowledge and understanding. The fable of Jonah being 'swallowed by a whale', or a great fish, indicates that he was 'swallowed' by higher knowledge - became initiated. He was in the 'whale' for three days, indicating the stages of the process, after which he was presumed dead. A poisonous plant (Mandragora) of the potato family, the subject of many strange fancies extended to other plants, such as white bryony. It was said to have the rudimentary shape of a human, with a head, two arms, and two legs forming roots and became an occult talisman capable of increasing the value of anything associated with it. This attribute appears to have been invented by the allegorists, as well as the strange superstition that the mandrake shrank from being touched, cried out with a human voice, and clung desperately to the soil embedding it. So the mandrake was portrayed as the subconscious. The story of a dog being used to drag the root from the earth and dying in the effort also emphasizes this point. See Bryony, Jerusalem artichoke. Oil of Vitriol is a hydrous sulphate of a metal, as blue, green and white vitriol, respectively that of copper, iron and zinc. The alchemists frequently used the word, for it was their acid which putrefied and killed all metals except gold. It was the vinegar given to Jesus on the cross. The alchemists also used the letters of the word to describe their art - Visita Interiora Terra Rectificand Invenies Occultum Lapidum, which means visit the interior of the earth (the centre of the mind) for by rectifying (purifying the conscious mind) you will find the hidden stone (the subconscious). (L. vitreus, glass). See Acid. Joy Lonsdale spent much of her life studying the Hermetic Code and corresponding with experts in the field. She attended a Gurdjieff group for years and was later a member of the Rosicrucians. Her first book Gurdjieff and the Arch Preposterous is an interpretation of Gurdjieff's great allegory, All and Everything. 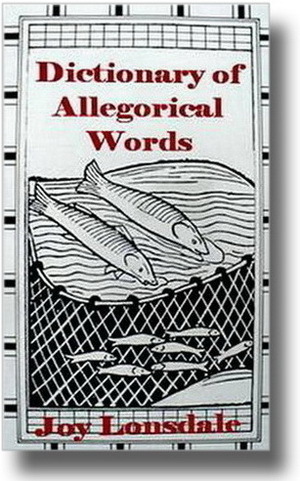 Her second is Dictionary of Allegorical Words. Talks With Al is an introduction to inner teaching presented as a deceptively simple series of dialogues between a teenage seeker and a guru. The Wisdom of Being reveals the secret behind Zen, Sufism, Christianity, The Fourth Way, Taoism and Vedanta.